CIG’s Tribal Vulnerability Assessment Resources and Tribal Climate Tool were featured in Hakai Magazine. This story includes comment from project lead, Meade Krosby. Under climate change, plants and animals will shift their habitats to track the conditions they are adapted for. As they do, the lands surrounding rivers and streams offer natural migration routes that will take on a new importance as temperatures rise. An open-access study led by the University of Washington Climate Impacts Group’s Meade Krosby pinpoints which riverside routes in Washington, Oregon, Idaho and western Montana will be the most important for animals trying to navigate a changing climate. The study was published this fall in PLOS One. “This corridor network is already there, and it’s already important for animal movement,” said lead author Meade Krosby, “Under climate change these will become ‘superhighways’ for animals that are seeking new places to live. CIG researcher, Heidi Roop, was quoted in a recent Grist article about winter weather in a warming world. “For most of the American West, winter snow is like a savings account for water. That stockpile of winter snow will melt all year, delivering a steady supply of water even into the hot, dry summers. A changing winter climate means more precipitation will fall as rain instead of snow. Wet winters and dry summers will put stress on ecosystems, agriculture, hydropower, and the millions of people who rely on snowmelt for drinking water. Methow Valley News: What does climate change mean for you? CIG researcher featured on Minnesota Public Radio: Growing acceptance of climate change. Now what? “Americans are rapidly coming to accept the reality of climate change. According to two studies released late last year, some 73 percent of the public now agrees climate change is happening, an increase of 10 percentage points since a similar survey in 2015. The number of Americans who say global warming matters to them personally jumped even higher — up 9 percentage points since March 2018 — to a new record high of 72 percent overall. Despite growing acceptance, there is no clear path forward. Close to 70 percent of Americans say they wouldn’t give even $10 a month to the government to fight climate change. A new poll by The Associated Press-NORC Center for Public Affairs Research and the Energy Policy Institute at the University of Chicago found that 74 percent of Americans say extreme weather in the past five years — hurricanes, droughts, floods and heat waves — have influenced their opinions about climate change. That includes half of Americans who say these recent events have influenced their thinking a great deal or a lot. CIG’s Lead Scientist for Science Communication, Heidi Roop, was quoted talking about the role of trust and lived experiences as being an important means for helping people connect to the current and future impacts of human-caused climate change. 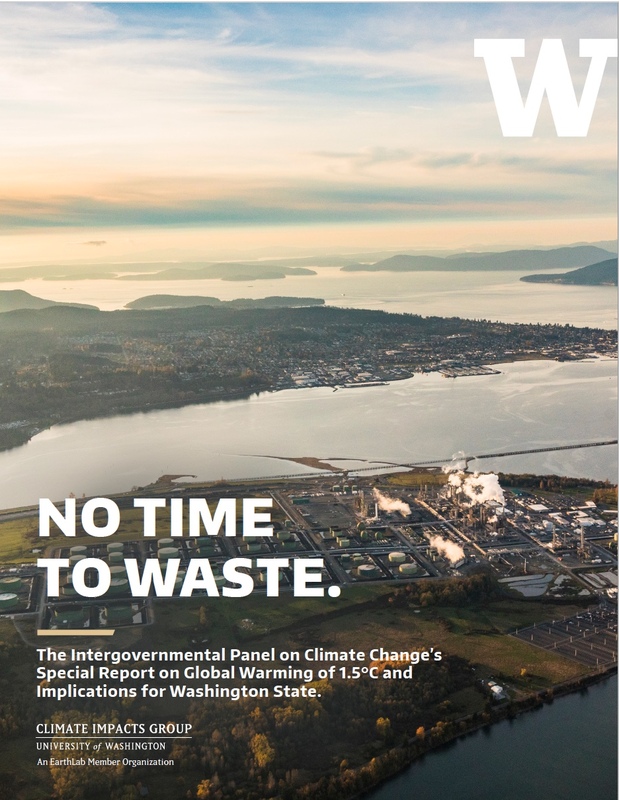 CIG scientist Heidi Roop commented in the Seattle Times on the latest tally of the state’s emissions which show that from 2012-2015 greenhouse gas emissions increased 6.1% in Washington state. “The state sent more than 97 million metric tons of greenhouses gases into the atmosphere in 2015, compared with just 90 million in 1990. Although emissions are rising, the 2015 figure represents progress from the year 2000, when emissions topped out at nearly 109 million metric tons.” Roop’s main take-away is that in light of recent national and international climate assessments, “We all need to be, as states and as a nation, taking a hard look at what we can do to reduce our emissions.